The Center for Civil and Human Rights pays homage to the Civil Rights Movement. Visitors are taken on a journey of interactive displays that bring to life segregation, the plight of the freedom riders, the lunch counter protests, the march on Washington, through the assassination of Martin Luther King, Jr. From there, guests are elevated to learn about how the Civil Rights struggles laid a foundation for the fight for Human Rights. Exhibits walk people through the aggressors and peacemakers in history and how each and every person can work to ensure that Human Rights are granted throughout the world. 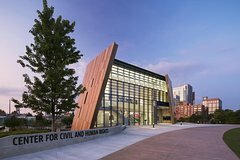 The Center for Civil and Human Rights is a unique and unparalleled experience that should be experienced by every visitor and resident of Atlanta. Awarded the 2016 TripAdvisor Certificate of Excellence.